Unlimited Ccreativity Hypnosis MP3 Download by Dr. Steve G. Jones, Ed.D. WANT TO TAP INTO YOUR TRUE POTENTIAL? …OR DO YOU WANT TO EXPLORE DIFFERENT AVENUES ARTISTICALLY SUCH AS PAINTING, SCULPTURE, ETC? Learn techniques of successfully installing “anchors” to tap in to your creative energy at will! Unlock your perfect flow state! Hypnosis has the ability to withdraw that which is deep within the mind but often pushed aside by thoughts needing more immediate attention. Such is often the case for those latently creative individuals that know that deep within them is the next great American Novel or musical masterpiece. 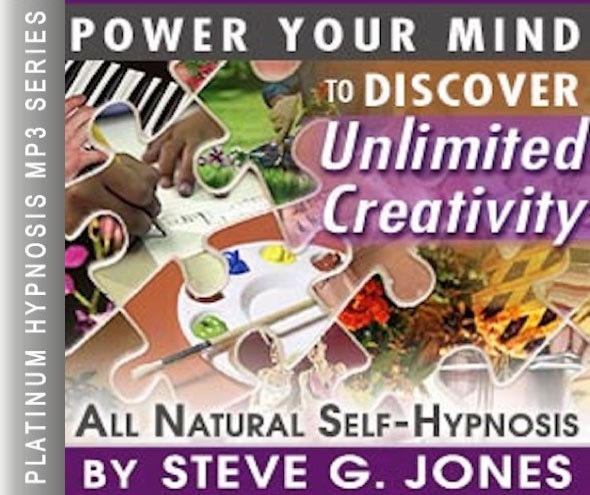 Through the Unlimited Creativity Hypnosis MP3 session, creative connections are made and the motivation to put the thoughts into tangible creations is possible. Whether the need to be more creative with writing, art, music, or every day problem solving is the goal, hypnosis can help. Even for those people who are not obviously creative but wish to become more so, hypnosis is an effective way to develop more creativity. That is because hypnosis works to relax an individual to the point that ideas and images can be suggested and put to use. For example, after a few weeks of creative training hypnosis, the listener can actually begin to think in more creative terms. This works because the signals and messages that spark creative thinking are already within the person. It is just a matter of relaxing the mind to the point that they are unleashed. Then as an added tool toward success, hypnosis teaches the listener to visualize their end goal of coming up with new ideas and putting them into action. Creativity is not limited to the fine arts. There are times when and imaginative and creative solution to an everyday problem is called for. Hypnosis can accomplish this type of creative thinking by removing stress factors that inhibit rational and unique solutions to problems or challenges. It also works to remove the negative thoughts creative hopefuls may have about their abilities. Clinical Hypnotherapist Steve G. Jones guides the listener of this unlimited confidence hypnosis mp3 download through a serious of relaxation steps that are completed when the listener can lie down and focus on nothing else, usually just before going to sleep at night. When this relaxed state is reached, the tools to creative thinking are introduced and ready to be implemented. Steve G. Jones achieves AMAZING and LASTING results!!! Hypnosis is the easiest way to affect change in your life because the positive messages go straight to your subconscious mind effortlessly so you can accomplish your goals and reach for the stars!! 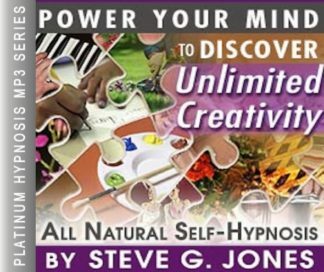 All you have to do is listen to the Unlimited Creativity Hypnosis MP3 download at night as you go to sleep!!! You’ll hear soft music, the gentle sounds of the beach, and the soothing sound of Steve G. Jones’ voice all working together to bring about positive changes in your life easily and naturally. Steve G. Jones has been helping people improve their lives with hypnosis for over 17 years…now it’s time for him to help YOU… don’t wait, do it NOW !!! you’ll be glad you did. See you at the top! I’d like for you to stop and think a little bit about how creative your life requires you to be. Perhaps your job calls for creative writing, brainstorming new ideas, or coming up with ways to make improvements in your company. Whatever you do for a living, my guess is that you have to be pretty creative. Perhaps you are a student who is having to write papers or elaborate on concepts; you too must be creative in your day to day life. Sometimes it is difficult to be creative every day. And sometimes it’s hard to come up with new, bright, and fresh ideas. The great thing about creativity is that it’s creative and the possibilities are endless. Creativity has no boundaries and no limits. Your mind never runs out of creativity. So in theory you have unlimited creativity, you just have to tap into your unlimited creativity resource. Hypnosis is a great way to expand on your thoughts and ideas. Hypnosis can help you find your ability to tap into your mind’s unlimited creativity. As you continue to relax, feel thoughts and images flood gently into your mind. As your mind opens more and more, feel thoughts and images flow easily into your mind. You will find your creativity increasing day by day. As your mind relaxes and allows creative thoughts to flow through it, you are able to channel creativity. Creativity flows through you. You are a beautiful, creative genius. You are a brilliant, wonderful, creative genius. Creativity flows through you easily and effortlessly. You are becoming more and more creative day by day. You allow this to happen. You relax your mind and thoughts come to you so easily. You are becoming more and more creative day by day. You are an amazing, beautiful, brilliant, wonderful, creative being. And you are becoming more and more creative everyday. Your mind is relaxed as you go through your day and your able to channel your creative thoughts. You are able to remember your creative thoughts and express them in a way of your choosing. You are a beautiful, wonderful, amazing, brilliant, creative being and you are becoming more and more brilliant and creative everyday. You are a brilliant, wonderful, amazing, brilliant, wonderful, amazing, brilliant, wonderful, amazing, talented, creative individual and you are becoming more and more beautiful, and talented and creative everyday and that feels wonderful. Creativity is something that is created in your mind and therefore is unlimited in supply. Whether you consider yourself an naturally creative person or not, you can tap into an unlimited amount of creativity simply by using hypnosis. Hypnotherapy is a great tool to use to tap into your unlimited creativity because it targets your subconscious mind, which is the source for your creativity! Your subconscious mind is where creative ideas come from, but it is a matter of communicating your ideas to your conscious mind. The Unlimited Creativity hypnosis program will train your subconscious mind to help you become more aware of creative ideas. We suggest you listen to this powerful Unlimited Creativity Hypnosis MP3 session for 21 nights in a row before going to bed. You will begin to see changes in your creativity as soon as the first session! You have an unlimited capacity for creativity. Hypnotherapy will help you reach an amazing amount of new creativity and create new ideas so that you can achieve unlimited creativity. The default mode network is often more active during periods of low demand i.e. relaxed state. It promotes spontaneous conceptual thought, which means more creative thinking (Modulating the Default Mode Network Using Hypnosis).